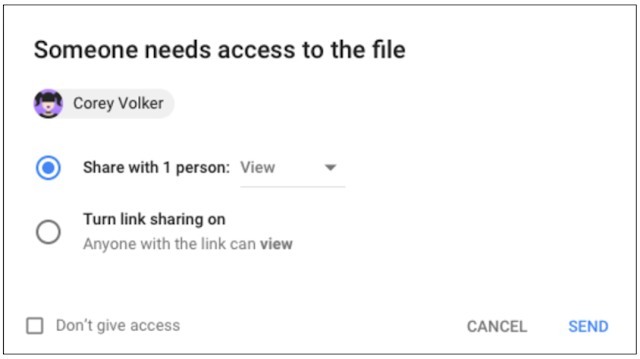 One of the tricky things about coordinating an email chain is always making sure everyone has access to the right files, but Google said it's making that easier in Drive. The next time you go to share a document or other file through email or a calendar invite its built-in access checker will be updated to show the names and email addresses of anyone you're including who doesn't already have permission to view it. Apparently it also "will anticipate who needs access to a file and intelligently default to sharing with those recipients only." Then you'll see the new prompt above, or choose a different option. The key thing, though, is that now it won't default to sharing via link, so hopefully making it smarter about specifying access will prevent any embarrassing leaks.